Set email_subj=”Your subject here” and email_addr=username@localhost if you have previously set email_alert=1. Note: That these are only the basic instructions to install ClamAV in order to integrate it with LMD. We will not go into detail as far as ClamAV settings are concerned since as we said earlier, LMD signatures are still the basis for detecting and cleaning threats. Now it’s time to test our recent LMD / ClamAV installation. Instead of using real malware, we will use the EICAR test files, which are available for download from the EICAR web site. Where 021015-1051.3559 is the SCANID (the SCANID will be slightly different in your case). Important: Please note that LMD found 5 hits since the eicar.com file was downloaded twice (thus resulting in eicar.com and eicar.com.1). This will help provide the necessary debugging information. 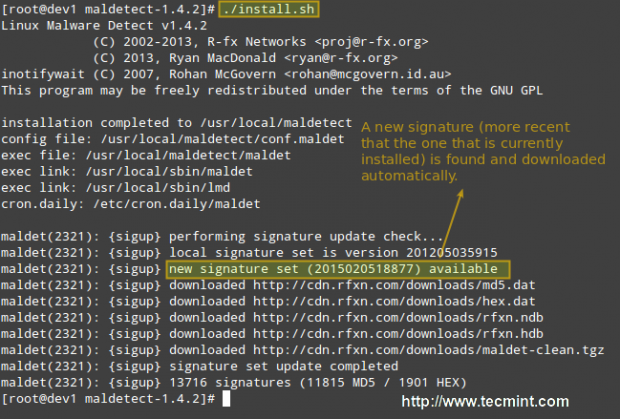 In this article we have discussed how to install and configure Linux Malware Detect, along with ClamAV, a powerful ally. With the help of these 2 tools, detecting malware should be a rather easy task. However, do yourself a favor and become familiar with the README file as explained earlier, and you’ll be able to rest assured that your system is being well accounted for and well managed.